Our plant cultivation rack is made of hot dip steel sheet. and also, with powder coating, it keeps durability and good-looking. It is available with safe in plant factory system. 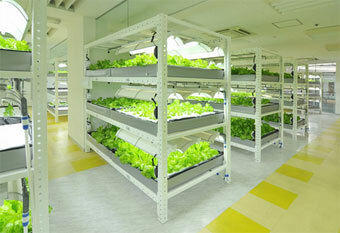 The multi-stage cultivation rack enable to harvest a plenty of crop per unit area. The multi-stage cultivation rack is knocked-down product. It's possible to install freely and make use of the rack with autometed warehouse system as lavor-saving device.